People are expecting the lightning fast browsing experience so that they can effortlessly get the information what they look for.Not only the internet surfers but the Google and other search engines also endorse the sites that load fast and offer high SERP (Search Engine Ranking Position). As the page loading speed is a major factor, the website owners are keenly looking for the ways to improve the loading speed of their business website. Now, let’s come to the hosting server of the website as the server response time plays a vital role in making the website load quick. There are literally thousands of hosting companies in the market, but you may consider getting the SSD web hosting. 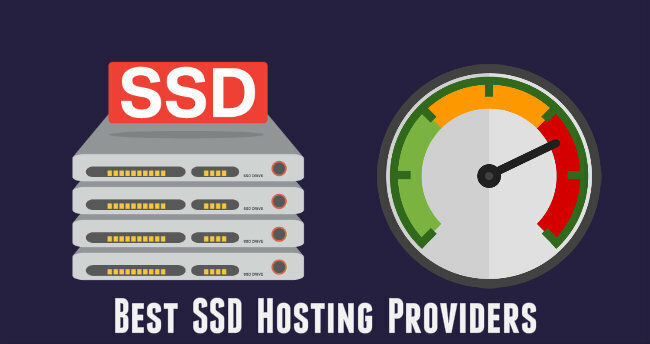 What is SSD web hosting and what are its benefits? Let me tell you the essential details of SSD hosting and some valid reasons to get it. Also, I would like to mention some best SSD webhosting companies so that you can choose the right one according to your requirements and the budget. Let’s start with the basics! If a web hosting company uses the SSD (Solid State Drive) for the storage medium, then it is called SSD hosting. SSD has non-volatile memory (integrated circuits) and does not contain any moving parts. Thus, there is no delay involved in the read & writes process and no data loss as well. In simple terms, SSD hosting can access the stored information faster than HDD hosting. Since it can contribute the optimized speed performance and advanced data security, the hosting companies utilize the SSD technology to offer a better web hosting environment for their customers. Since the SSD contains microchips and no physical part running inside, it has several benefits over the HDD (Hard Disk Drive) and results in stable and fast hosting speed. The data Read & Write process is simultaneous, and it helps the server resources to react better and faster. The energy consumption is very low, and hence it is an eco-friendly web hosting that saves the electrical power. No mechanical vulnerabilities and thus no data loss frustration. You can adore the improved security features. As the fragmentation is not needed, it can offer the quick and consistent performance. InMotion is the leading web hosting company that offers 100% satisfaction guarantee for its users through its eco-friendly service. Even the experienced webmasters trust this server company as it is fast and reliable. Providing a complete hosting solution for all types of business requirements, InMotion is blessed with an award-winning support team who are ready to react quickly to the customer queries. Coming to the SSD feature of InMotion, you never need to worry about the data loss. Yes, their SSD servers use RAID cards with battery-backed non-volatile caching. So, your data will be stored in Cache to prevent the data loss in case of sudden power loss. Moreover, this cheap fast hosting has taken the anticipatory measures to make sure that their customers experience zero effect from the potential SSD failures. Out of all, their solid-state drives are placed in RAID-6 configuration with additional backup drives. I would say that it is fastest hosting for WordPress and you can grab a huge InMotion discount. Yes, recently I have read my friend, Nirmala’s blog, WPGlossy where she offers the InMotion coupon code for her blog readers. GreenGeeks is the main competitor of InMotion hosting since it too provides the green energy SSD web hosting for the users. Understanding the requirements of the customers is their primary target, and hence they focus on solving the technical issues (If Any). The company guarantees 99.9% uptime, and you will get unlimited SSD web space here (in all hosting plans). If your website grows, you can easily upgrade the resource through the scalable platform. I should have a word about the SSD feature of this fast server hosting and yes, it has Solid State Drive RAID-10 Storage Array's to make your website load blazing fast. It also supports built-in caching system and CDN for quick performance. GreenGeeks VPS plans have reliable storage architecture and SSD storage array for maximum performance & redundancy. For WordPress users, it provides solid reliability, lightning fast performance and enhanced security with DDoS protection. No matter whether you are a professional developer, new business owner or an established blogger, you can get the cheap and best SSD hosting service from A2 Hosting. It is one of the oldest hosting companies founded in the year 2003. Their primary aim is to offer the fast and ultra-reliable solutions for the customers. As the A2 hosting gives the complete SSD solution for all your files, OS and Database, you can get the improved site speed performance. Offering the free SSD for all the affordable hosting plans is the notable feature of this best fast hosting. Most of the plans support faster turbo servers to perk up the speed of your site to 20X faster. You may reach the user-friendly support team of this fast web host who works round the clock to solve your tech glitches. Launched in the year 2004, SiteGround has turned into a renowned hosting provider. The company proudly says that it has hosted more than 500K domains and the number keep on increasing. Using the hottest speed technologies and having the tight security rules are the main highlight of this fastest hosting provider. For improved speed, SiteGround uses SSD drives and CDN for all hosting plans. Here, all your files and databases will be stored on the cutting-edge solid state drive technology which could offer a 1000X increase in input and output operations when compared to the regular disks. Along with the SSD feature, you will also get the NGINX server technology, super caching mechanism, and free SSL benefits from SiteGround for the speed optimization. StableHost – You might have heard this hosting for the first time through my best SSD web hosting companies post. Even though the Stablehost is not a big hosting brand, it is worth to mention in my list and let me tell you the reasons. This affordable hosting company uses the best hardware and premium spam filtering technology to catch the spam emails. Technical support is also top notch as they are dedicated to their profession and would love to help you have a better website. Now I should talk about the SSD feature of Stablehost hosting. All the hosting plan of this fastest hosting server run under pure SSD drives, and you will get your hands on the unlimited RAID 10 disk space. Purchasing the cheap web hosting powered by SSD is really a great opportunity for the website owners who would like to take their site/business to the next level. I was surprised to see the extensive positive reviews (5-star reviews) by most of the users, and hence I've included this best hosting instantly in my list of fast hosts 2017. With a fast loading website, you can give the best browsing experience to your visitors, drastically increase the conversion rate of your business and delight the search engines to get the high rankings as well. It is highly recommended to get the SSD hosting than the traditional hosting as it could significantly boost the speed of your site. Through this piece of content, I hope that you have understood what is SSD hosting, its benefits and some of the fastest hosting companies that possess SSD quality for improved page load speed. So, what is your opinion about these best SSD web hosting companies? Which hosting server are you using for your site? How fast is your website load? Would you like to get the hosting company that has SSD excellence? Share your entire perspective in the comment section. I am new blogging field. I just started my new blog on wordpress and hosted in Digital Ocean. Does this SSD require for my site to make it fast. I am newbie kindly guide me. First i want to congrats you for choosing this Blogging Field. Yes. Sure you can use the above mentioned SSD web hosting services to boost the speed of your site. You can contact me at any time for your doubts regarding blogging. Thanks for dropping your comment here. Keep Coming. It’s really a fantastic post.Thanks for sharing. Great list of web hosting services that provide blazing top loading speed which helps in reducing the bounce rate of the website, As personally I am using InMotion web hosting for hosting my website and satisfied with the service, your article will really help other to choose the best domain webhosting service. Hi! I need help with writing some blog articles for an IT website. PM me if you're interested. SSD is little bit costly hosting but is great for hosting a website because you can experience a very high-speed site performance and the page load time will be very less as compared to HDD hosting. If your website has huge traffic, then I recommend you SSD hosting. yes ssd hosting little bit coasting but effective it can make your site speed past, that will be good as seo point of view thanks for sharing.